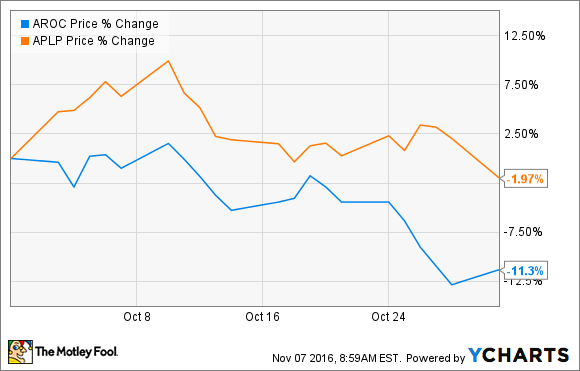 Shares of Archrock Slide 11% in October, Should Investors Worry? Factors largely out of Archrock's control took a toll on its stock price last month. Shares of Archrock (NYSE:AROC) slid 11% in October. While much of the company's share price movement was related to larger marco factors like the upcoming OPEC meeting, the company did announce a major drop-down transaction with its subsidiary partnership Archrock Partners (NASDAQ:APLP). This is one of those instances where factors that really have no direct control over Archrock's business had some pretty significant impacts on the company's stock price. The recent announcement that some OPEC members were looking to get exemptions from the planned production cuts has made Wall Street a little nervous about the potential recovery of oil and gas prices and, as a result, oil and gas activity. The latter is really what matters for Archrock and Archrock Partners because their business is so intrinsically tied to oil and gas activity in the U.S. Its compression services are a necessity when it comes to gathering and processing and long haul piping of gas and liquids. The recent uptick in oil and gas drilling activity has largely been responsible for the company's 45% uptick in stock price so far this year, if anything was to disrupt all that oil and gas activity, it would quickly put a damper on the company's business, especially for Archrock Partners. That dynamic was accentuated even more when Archrock dropped down about 150,000 horsepower worth of compression assets -- about 4% of the company's total horsepower -- to Archrock Partners in a transaction on Oct. 31. All of these assets being dropped down are under fee based contracts with oil and gas companies. As long as those companies continue to grow production, then these assets will be fine, but it could get a little hairy if its customers were to back down activity again from lower commodity prices. This is one of those cases where the general oil market cried wolf and it sent every oil and gas related stock into a frenzy, but it's hard to see this having a lasting impact on Archrock or Archrock Partners. The thing that really matters for this company is continuing to see incremental gains in drilling activity and pipeline volumes, because that requires more and more of Archrock's services. That being said, the two entities don't have exactly the most robust financial standing. Archrock could use a rapid uptick in business such that it can address its higher than average debt load and build a balance sheet that will be able to better withstand the ups and downs of the market. Archrock Posts Its First Positive Income Result in Years: Time to Buy? Do Archrock's Post-Merger Results Make It a Buy Already?